I went to church last Saturday night. Well, it was sort of church. 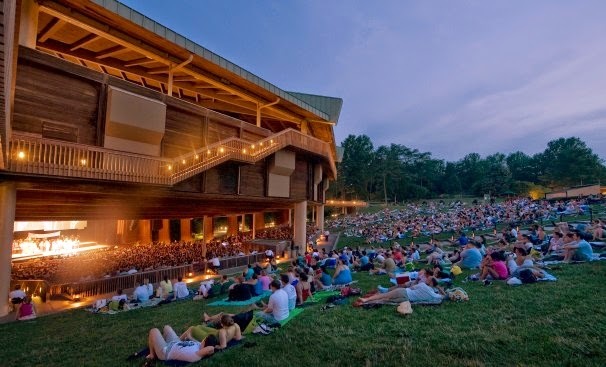 Every Memorial Day weekend for the last several years, my family has charged down the lawn at Wolftrap to snag a good pik-a-nik spot in that lovely venue. It's a bit like the running of the bulls at Pamplona, only with liberals instead of livestock. We've settled in to watch Garrison Keillor do his Prairie Home Companion thing, live on the air. This year, it was lovely, perfect and clear-skied. The lawn--the cheap "seats" out there in the grass, that are both cheap and the best--was wildly multigenerational, filled with families and couples and clusters of friends, the old and the young. Keillor is aging, and he looks it. My thirteen year old, who made a point of going up to him as Keillor wandered the audience singing before the show, said he looked so much older up close. But his handshake was firm, said my son, and he looked you right in the eye. "What will happen when he stops doing this," my son asked after the show. "Something else, probably," I said. "But he's got a couple more years left in him." "Good," said my son. The stories of Lake Wobegon are well-worn and familiar, like the tales told by a beloved grandparent. He's been around for a long time, but for the generations that didn't grow up with him? For them, he's new, as the world is new. I could tell by watching them. My teenagers abandoned their screens, which does not happen often. They listened to the stories and the radio stageplays, and laughed. They took to our binoculars and marveled at the sound of live music from generations past. The twenty-something hipster-cluster sitting two blankets to our left nodded along and smiled at his gently meandering tales and drank their two-buck Chuck. By the thousands and tens of thousands, folks were there to be part of that music and storytelling. The lawn was full, totally full, not like the stock picture up there I snagged from Google for you to look at. I wish church was more like this sometimes, I found myself thinking. But it was church, sort of. Faith language weaves in and out throughout Keillor's storytelling, which feel at times on the cusp of being sermons. Before the show, there was singing, and mixed in with classic favorites and songs of national identity there were old hymns, to which the gathered thousands sang along. And for such a liberal show, it was also paradoxically conservative. Old music and old gracious stories mingled with a warm and nuanced patriotism and a gentle, tolerant faith. It's progressive, I suppose, because you cannot make progress unless you hold on to what is good. It wasn't an anxious event, not trying to be anything other than what it was. Babies cried, toddlers squawked, and people laughed and talked softly, and picked their way through the crowd on their way to the bathroom. There we were, sitting in the back pews, sipping our wine.